meetinvest Reviews - Is it a Scam or Legit? 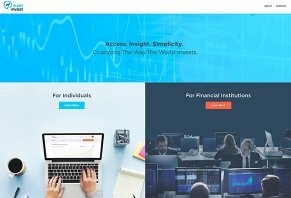 Meetinvest is a stock information website where you can use the methodologies of more than 30 well-known investors and the advice of the meetinvest community to formulate their own strategy for picking stocks. Meetinvest is a free investing information website which combines expert advice, predictive algorithms and social networking. Unlike robo-advisors Betterment and Wealthfront, meetinvest doesn’t actually broker stock sales – it simply provides investing information. The company is based in Switzerland and was founded by husband-wife duo Marla and Michel Jacquemal. Marla, a journalist, wanted to learn more about investing so she started reading through various books and products about investing. She discovered that, between wordy books and personal advice from financial professionals, most of what was taught was wrapped up in super-jargony language that average people could barely understand. At the time of publishing, meetinvest offered accounts to individuals and financial institutions. Some of the important questions to be asked about this site are: What does it do? Where does it get its information? What are other people saying about it? We're going to answer each of these questions as we explore what meetinvest can offer individuals and financial institutions. As we said in the introduction to this review, meetinvest isn’t a true robo-advisor like Betterment or Wealthfront because the algorithms they use don’t play a part in an investment purchase on the site. Rather, meetinvest says, they offer people like you and me a systematized collection of information based on algorithms and insight from experts. You then, in theory, can take that information and incorporate it into your decision about which stocks to buy. At the heart of the meetinvest method is a four-pronged approach to your investments: advice from more than 30 experts, a how-to on the specifics of stocks, a section of insight into the “when” of buying stock and guides on how to cultivate your investment wisdom and strategy. Now, the “advice” you get from experts is basically a summary of their investment strategy presented in a way that helps you formulate your own strategy for purchases. To get a feel for what it’s like to join meetinvest, we went through the new user application. Creating a new account is as simple as connecting your Facebook, Google, LinkedIn or Twitter account. You also have the option of giving a username and password. Once you’ve linked one of these accounts or done a username/password, meetinvest asks you to identify areas of interest that will help you connect with investors of similar interest. We chose healthcare tech and agriculture. With your areas of interest now in place, you’re moved to a profile management page where you can add basic information: gender, birthday, country, state and language. If you signed up with a social media account, then your profile photo will most likely be imported from your account. From there, your account is ready to roll. When you’ve got your account open, you’ll have four main options on your account page: My Feed, My Stocklists, Insights and Run Strategies. This feature is the social component of meetinvest and the reason why “meet” is in the company’s title. Remember those areas of interest we mentioned during the setup process? Your answers are designed to link you to other meetinvest investors with the same interests. Once you’ve followed a few people, their posts will start to show up in your feed. Clicking on updates and posts allows you to read them and respond to them like you would a social media post. You can also use the My Feed feature to share your portfolio with others. Your “My Stocklists” allows you to create new stocklists and see the ones you’ve already made. A stocklist is a list of search results the site generates based on two criteria: An expert’s strategy and your country of interest. You can choose from multiple experts – 30 in total – and 101 countries in seven different regions of the world. In many cases, you’ll have at least two different variations of an experts strategy. For example, Michael Higgins’ Dogs of the Dow approach comes in 5-stock or 10-stock varieties. Before you can create a stocklist, you’ll also have to give the stocklist a name. Once you do, click on “Create stocklist” and you’re ready to get your information. We did a test run, choosing John Neff and the United States. Neff’s “Contrarian Strategy” was applied to all the stocks in meetinvest’s U.S. stocks database and 26 stocks were selected based on criteria derived from Neff’s investment philosophy. In other words, meetinvest wants you to treat their stock information the way you would ratings for a particular car you want to buy. You can check websites to find out vital information like crash ratings and reliability, but, ultimately, you’re the one who decides to buy a certain car. The stocklists you create are tracked over time to allow you to see each stock’s performance. Not happy with your current list? You can create another one using a different expert’s strategy. In addition to showing you the list of information for each stock, meetinvest allows you to plug a hypothetical investment amount into their models starting with a minimum investment of $10,000. We browsed through some of the subcategories in each of these topics and found extensive, in-depth information about a wide variety of stock topics. Based on what we read, we believe that meetinvest lives up to its mission of providing stock information in an easy-to-read, non-jargony way. Pro tip: Meetinvest’s calculations of a stock’s earnings don’t take into account any fees, commissions or maintenance fees you’ll incur using a brokerage website or investing app. The meetinvest “Run Strategies” button allows you to run all your stocklists through their investment strategies to make sure you have the most up-to-date information. The company says they automatically update stocklists once a day, Monday through Friday. As a user, you can connect with other users and follow them to get updates on any posts they publish. You can also start or join groups based on interests. We checked out a few of those groups and found minimal interaction and a lack of posts. The financial institution accounts function the same way individual user accounts do – advisors and planners can use the investing models of more than 30 experts to identify stocks that fit within an expert’s framework. The company’s website says that they can integrate the meetinvest platform into a company’s existing investing platform, making it easy for employees and clients to incorporate the platform's stock algorithms into existing websites. “Our product is more than just a front-end tool and can be integrated on the front, middle and back end to maximize the ease for the end user experience,” their site says. There are several investing websites we read to get a sense of what investment experts said about meetinvest. Ng went on to say that the site has its quirks but that he likes the idea of integrating social media and stock advice. “I think that it is an innovative investing platform that can be very helpful to investors who like being in control of their portfolios, who want to invest on their own and have the dedication and persistence to do this systematically,” contributor Maria Nedeva wrote. The College Investor’s Alexa Mason said she liked how you can easily create a stocklist based on country and investment strategy, but that a lot of the information on the site was over her head. Granted, meetinvest does a great job of putting stock investment in plain language. However, we think Alexa has a good point: If you’re new to investing, all the information provided on the site might be a little overwhelming. We find meetinvest to be a very interesting informational tool and quite unique in a world of investment apps and websites that focus on investing your money rather than giving you information with which to make your investment choices. Our trial run with meetinvest’s individual account was very positive. We like how easy it was to set up and account and, because this is an information-only site, you don’t have to worry about connecting financial accounts and offering any personal information aside from your name, state and birthday. We can’t speak to the financial institution side of things because we weren’t able to access that portion of their website accounts. However, if meetinvest is able to fluidly integrate their platform into a company’s trading pages, we could see great benefits for financial advisors and their clients. If there’s one thing we’d say is missing from the site, it’s more user-generated content. The few groups we viewed didn’t have any posts or, in the case of a group for people interested in soybean commodities, just one post from the founder. Who is a Good Fit for meetinvest? In our opinion, meetinvest is an excellent site for people who use apps like Robinhood and Stockpile or established brokerage firms. The information you get from the site is so easy to use and so well-organized that, if you want to learn more about stocks and various strategies, it’s hard to not be on the site for more than five minutes without adding a bit of wisdom or advice to your educational arsenal. Consider this website a companion piece to your regular brokerage service. The information you get on meetinvest isn’t advice, per se, from its founders, but more like a math-backed library of the investment strategies of some pretty successful investors in the United States and abroad. As we mentioned in the previous section, the site’s information is a good companion piece for your single-stock purchases. If you’re reading up on meetinvest because you thought you could actually buy stock through the site, then check out our reviews of single-stock purchase apps Robinhood and Stockpile. Should you have an appetite for ETF’s, you’ll enjoy our in-depth explorations of Wealthfront and Betterment. Each one of these reviews examines what the site offers, what their fees are and what other people are saying about them. Write a Review for meetinvest!